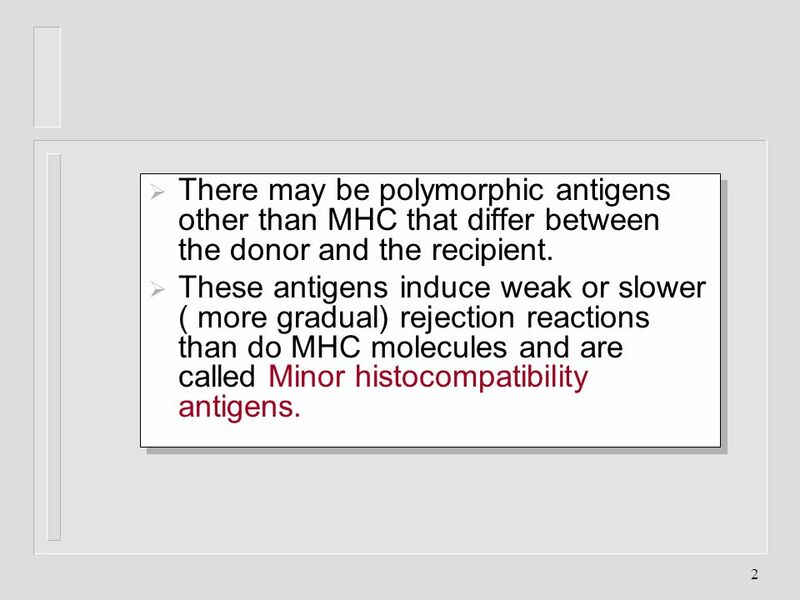 2 There may be polymorphic antigens other than MHC that differ between the donor and the recipient. 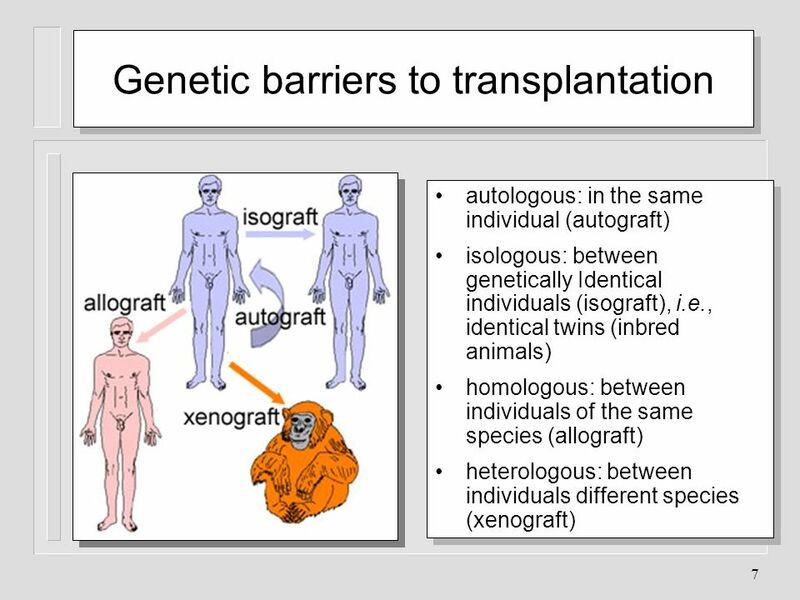 autologous: in the same individual (autograft) isologous: between genetically Identical individuals (isograft), i.e., identical twins (inbred animals) homologous: between individuals of the same species (allograft) heterologous: between individuals different species (xenograft) Histocompatibility (transplantation) antigens: Antigens on tissues and cells that determine their rejection when grafted between two genetically different individuals; Major histocompatibility (MHC) antigens: Histocompatibility antigens that cause a very strong immune response and are most important in rejection; MHC complex: Group of genes on a single chromosome encoding the MHC antigens; HLA (human leukocyte antigens): MHC antigens of man (first detected on leukocytes); H‑2 antigens: MHC antigens of mouse; Xenograft: Grafts between members of different species (also known as heterologous, xenogeneic or hetero- grafts); Allograft: Grafts between two members of the same species (also known as allogeneic or homo- graft); Isograft: Grafts between members of the same species with identical genetic makeup (identical twins or inbred animals); Haplotype: a group of genes on a single chromosome. 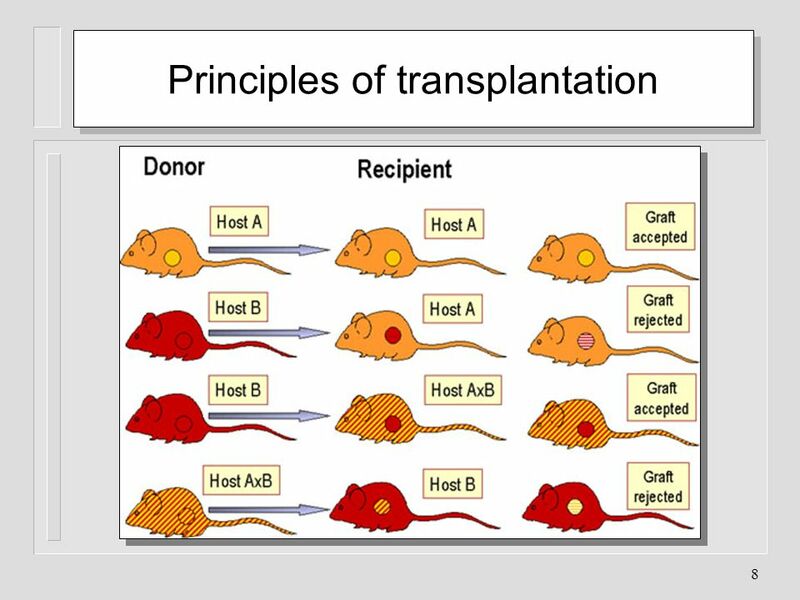 LAWS OF TRANSPLANTATION: An immunocompetent host recognizes the foreign antigens on grafted tissues (cells), and mounts an immune response which results in rejection. 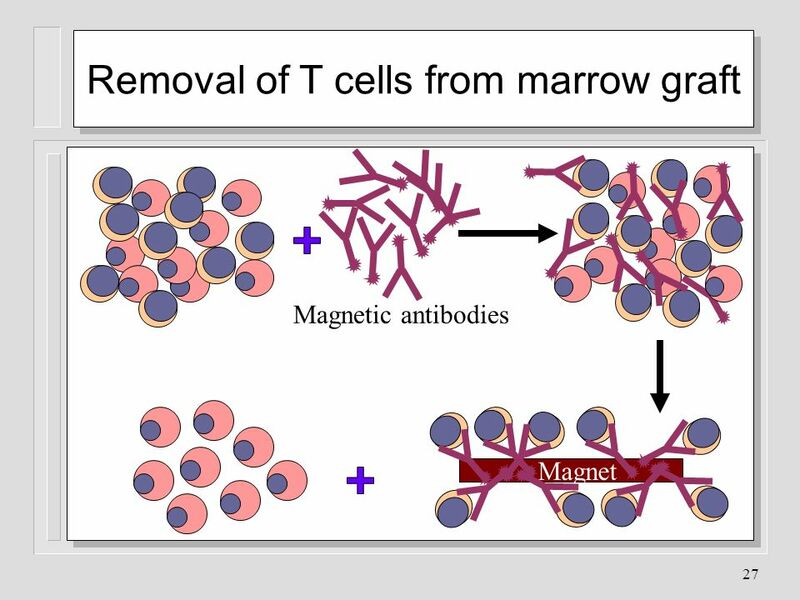 On the other hand if an immunocompromised host is grafted with foreign immunocompetent lymphoid cells, the immunoreactive T-cells in the graft recognize the foreign antigens on the host tissue and cause their damage. 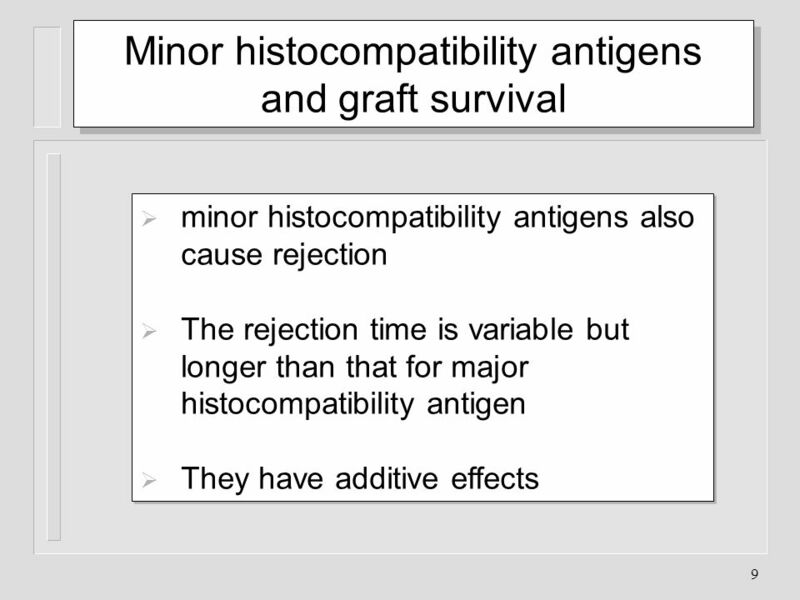 minor histocompatibility antigens also cause rejection The rejection time is variable but longer than that for major histocompatibility antigen They have additive effects Host-versus-graft-reaction: The time of graft rejection follows the following order: xeno-<allo-<iso-=auto- graft. 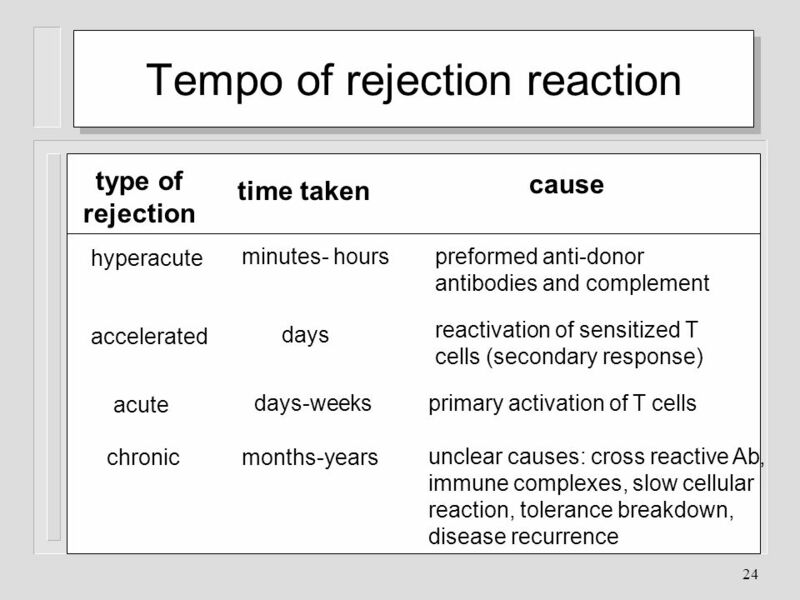 The time of rejection also depends on the antigenic disparity between the donors and recipient. 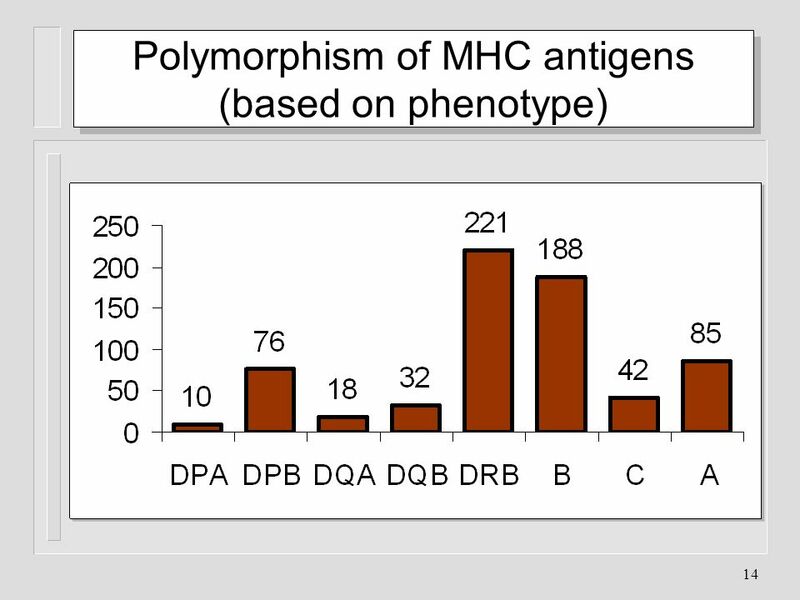 MHC antigens are the major contributors in rejection, but the minor histocompatibility antigens also play a role. Rejection due to disparity in several minor histocompatibility antigens may be as fast or faster than rejection due to an MHC antigen. 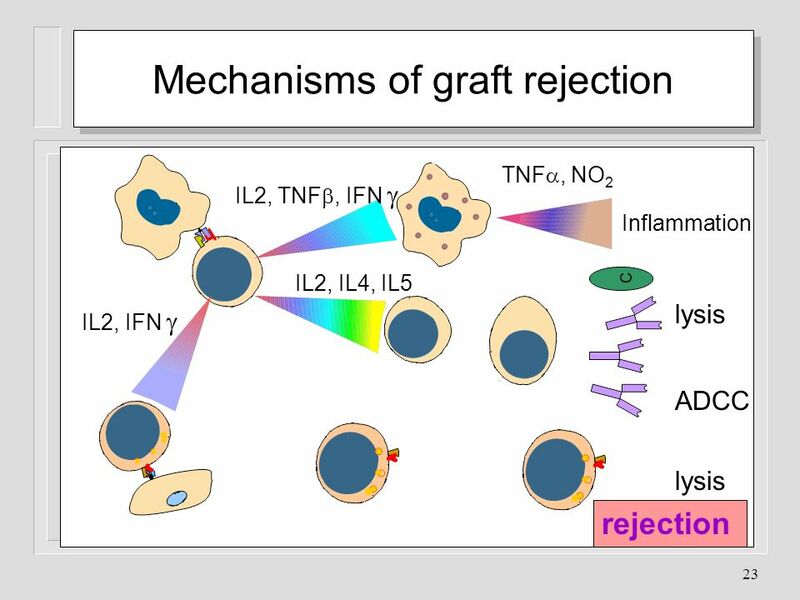 Like in other immune responses, there is immunological memory and secondary response in graft rejection. 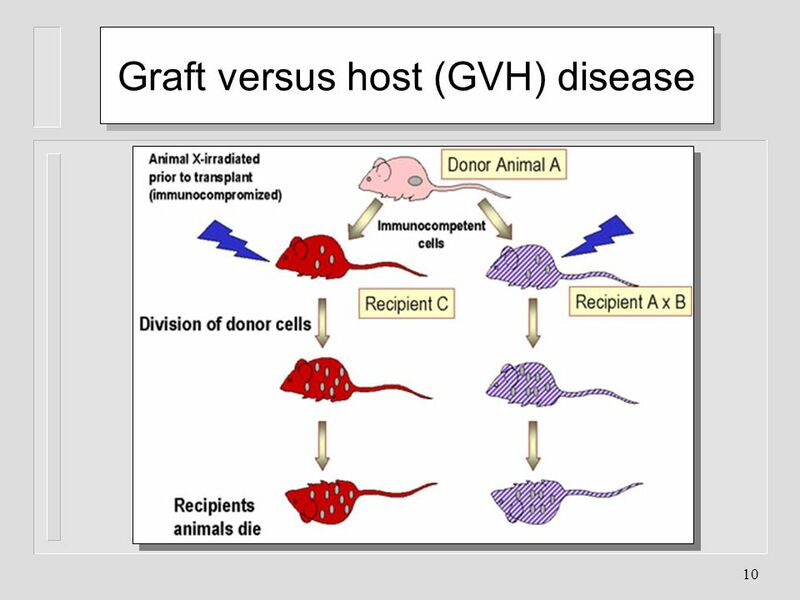 Thus, once a graft is rejected by a recipient, a second graft from the same donor, or a donor with the same histocompatibility antigens, will be rejected in a much shorter time. 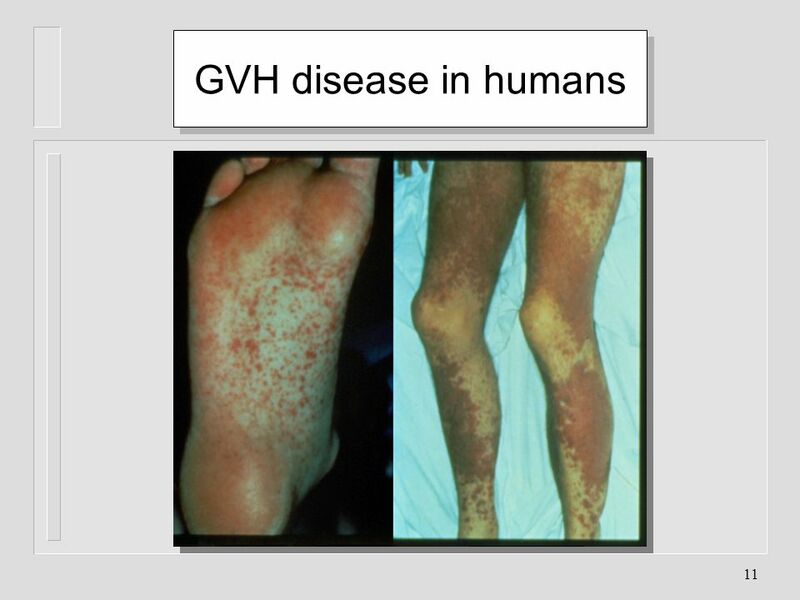 11 GVH disease in humans Common manifestations of GVH reaction are diarrhea, erythema, weight loss, malaise, fever, joint pains, etc. and ultimately death. 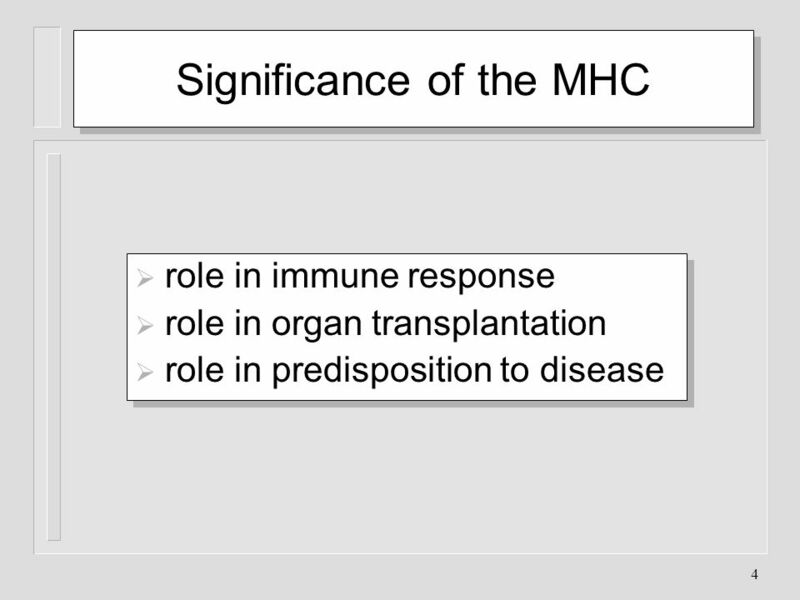 The MHC complex contains a number of genes that control several antigens, most of which influence allograft rejection. These antigens (and their genes) can be divided into three major classes: class I, class II and class III. The class I and class II antigens are expressed on cells and tissues whereas as class III antigens are represented on proteins in serum and other body fluids (e.g.C4, C2, factor B, TNF). Antigens of class III gene products have no role in graft rejection. 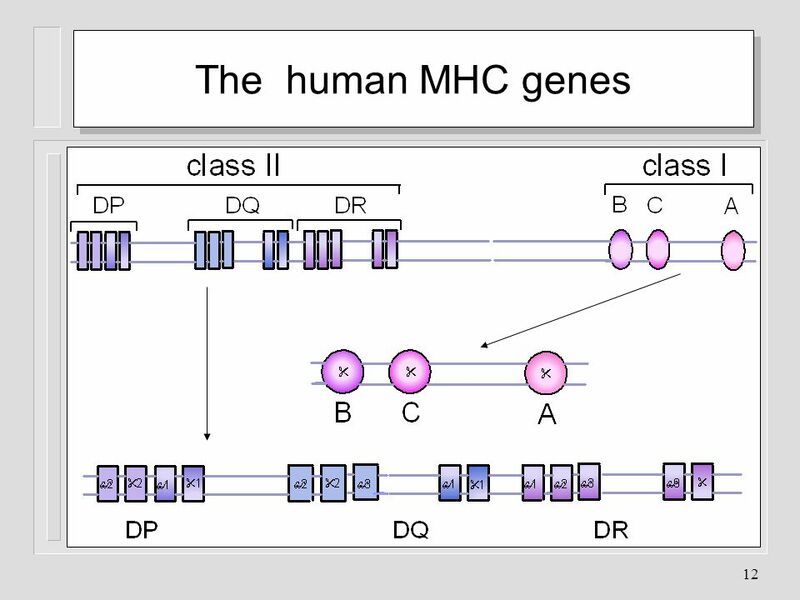 Human MHC: Class I MHC: The class I gene complex contains three major loci, B, C and A and other undefined minor loci (Figure 1). Each major locus codes for a polypeptide, "-chain that contains antigenic determinants, is polymorphic (has many alleles) and associates with $-2 microglobulin ($-chain) and expressed the cell surface. Class II MHC: The class II gene complex also contains at least three loci, DP, DQ and DR; each of these loci codes for "- and one ß‑chain polypeptides which associate together to form the class II antigens. Like the class I antigens, the class II antigens are also polymorphic. DR locus may contain more than one (up to 4) functional $-chain genes. Mouse MHC: The mouse MHC is located on chromosome 17. It consists of two major loci, K and D. Unlike the human MHC, the mouse class I gene complex loci are not together but they are separated by class II and class III genes. The class II gene complex contains two loci, A and E each of which code for one " and one ß chain polypeptide, which form one class II molecule. The mouse class II gene complex is also known as the I region and the genes in this complex are referred to as Ir (immune response) genes since they control the magnitude of immune responsiveness of different mouse strains to certain antigens. Products of A and E loci are also termed IA and IE antigens, collectively known as Ia antigens. Nomenclature: HLA specificities are identified by a letter for locus and a number (A1, B5, etc.) and the haplotypes are identified by individual specificities (e.g., A1, B7, Cw4, DPw5, DQw10 DR8). Specificities which are still under scrutiny contain an additional letter 'w' which stands for workshop at which they are temporarily assigned these numbers until they are sufficiently defined (e.g., Cw7, DQw1, DRw6, etc). Mouse MHC (H‑2) specificities are identified by a number. Since laboratory mice are inbred, each strain is homozygous and has a unique haplotype. The MHC haplotype in these strains is designated by a ‘small’ letter (a, b, d, k, q, s, etc.). 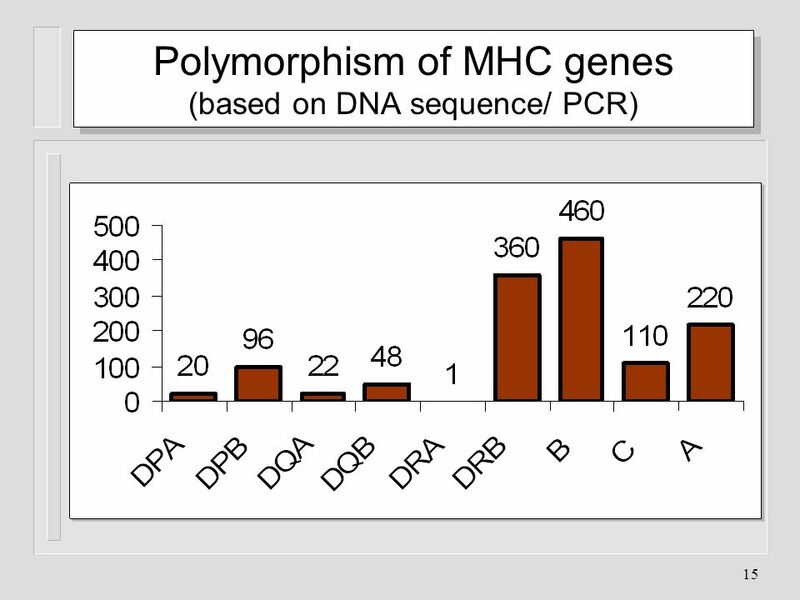 For example, the MHC haplotype of Balb/c mice is H2d. MHC ANTIGENS: Nomenclature: HLA specificities are identified by a letter for locus and a number (A1, B5, etc.) and the haplotypes are identified by individual specificities (e.g., A1, B7, Cw4, DPw5, DQw10 DR8). Specificities which are still under scrutiny contain an additional letter 'w' which stands for workshop at which they are temporarily assigned these numbers until they are sufficiently defined (e.g., Cw7, DQw1, DRw6, etc). 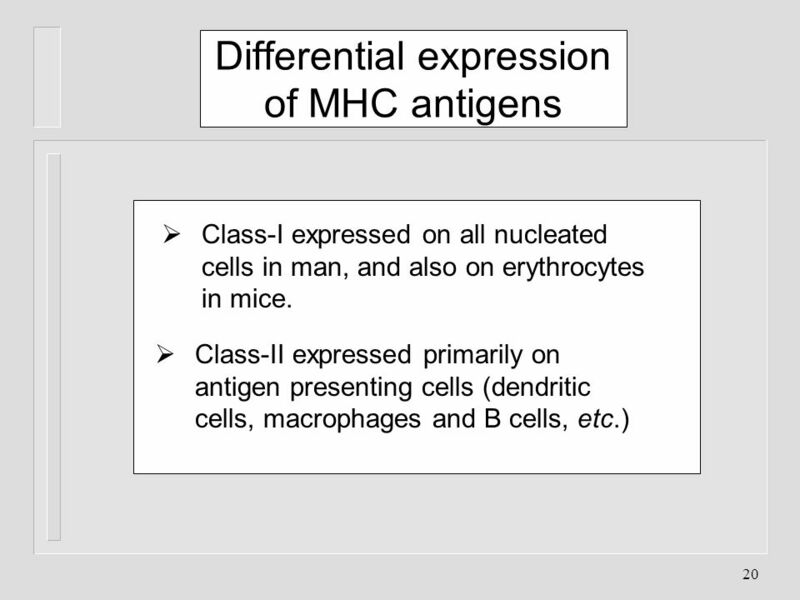 Mouse MHC (H‑2) specificities are identified by a number. Since laboratory mice are inbred, each strain is homozygous and has a unique haplotype. The MHC haplotype in these strains is designated by a ‘small’ letter (a, b, d, k, q, s, etc.). 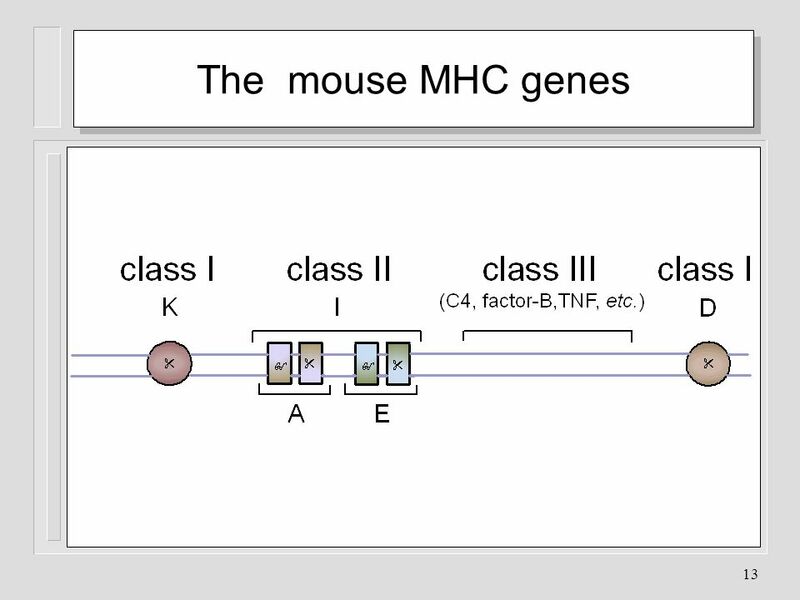 For example, the MHC haplotype of Balb/c mice is H2d. 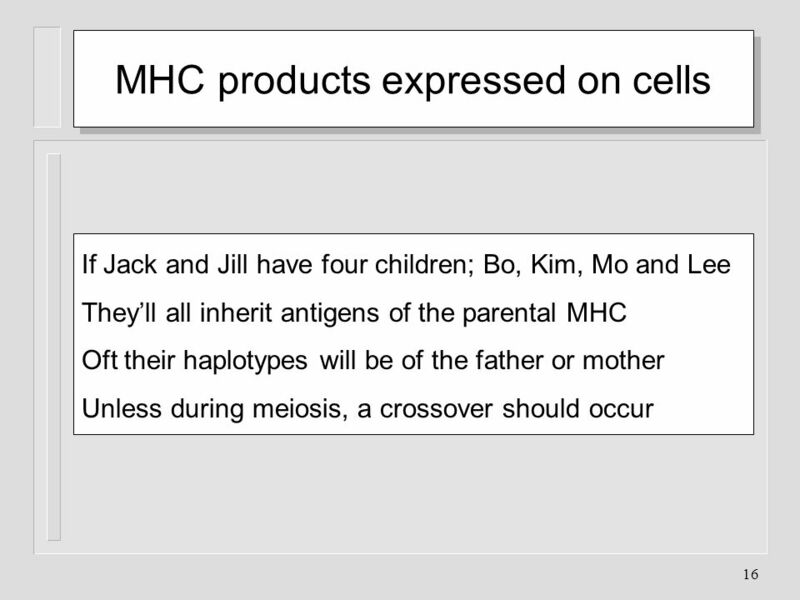 If Jack and Jill have four children; Bo, Kim, Mo and Lee They’ll all inherit antigens of the parental MHC Oft their haplotypes will be of the father or mother Unless during meiosis, a crossover should occur Inheritance: MHC genes are inherited as a group (haplotype), one from each parent. 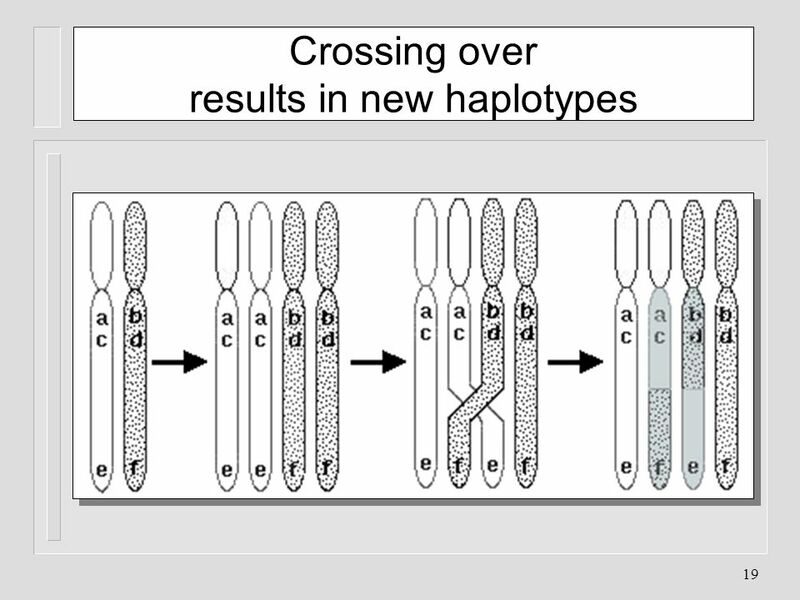 Thus, a heterozygous human inherits one paternal and one maternal haplotype, each containing three class-I (B, C and A) and three class II (DP, DQ and DR) loci. Therefore, a heterozygous individual can inherit a maximum of 6 class I specificities (Figure 2). Since the class II MHC molecule consists of two chains, with some antigenic determinants (specificities) on each chain, and they can associate in cis (along the DNA strand) or trans (across two DNA strands) combination, each individual can have four specificities for each of the three class II loci. Likewise, a heterozygous mouse inherits one haplotype from each parent containing two class-I loci (K and D) and two class II loci (A and E), each in two allelic forms. It, can therefore, express on its cells a total of 8 MHC antigens (2 class I antigens and 2 class II antigens from each parent). MHC genes are inherited as a group (haplotype), one from each parent. Thus, a heterozygous human inherits one paternal and one maternal haplotype, each containing three class-I (B, C and A) and three class II (DP, DQ and DR) loci. Therefore, a heterozygous individual can inherit a maximum of 6 class I specificities (Figure 2). Since the class II MHC molecule consists of two chains, with some antigenic determinants (specificities) on each chain, and they can associate in cis (along the DNA strand) or trans (across two DNA strands) combination, each individual can have four specificities for each of the three class II loci. Likewise, a heterozygous mouse inherits one haplotype from each parent containing two class-I loci (K and D) and two class II loci (A and E), each in two allelic forms. It, can therefore, express on its cells a total of 8 MHC antigens (2 class I antigens and 2 class II antigens from each parent). 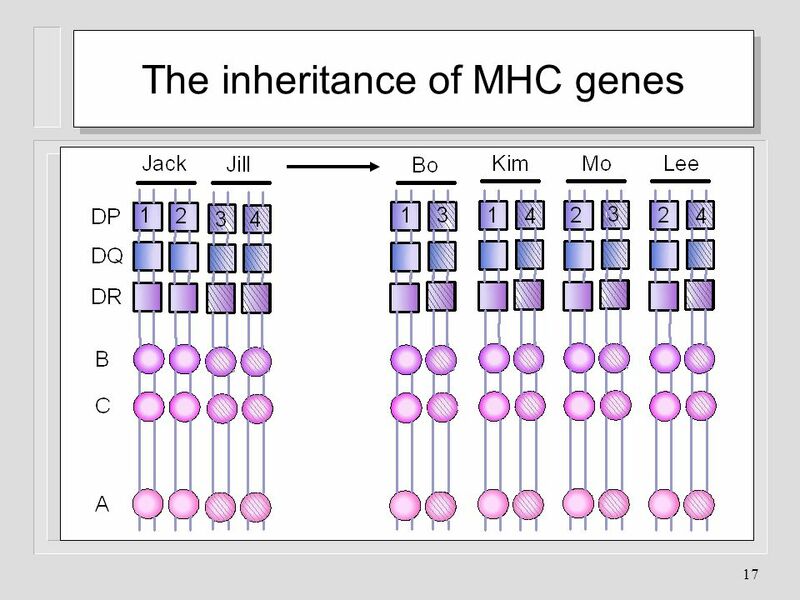 Inheritance: MHC genes are inherited as a group (haplotype), one from each parent. Thus, a heterozygous human inherits one paternal and one maternal haplotype, each containing three class-I (B, C and A) and three class II (DP, DQ and DR) loci. Therefore, a heterozygous individual can inherit a maximum of 6 class I specificities (Figure 2). Since the class II MHC molecule consists of two chains, with some antigenic determinants (specificities) on each chain, and they can associate in cis (along the DNA strand) or trans (across two DNA strands) combination, each individual can have four specificities for each of the three class II loci. Likewise, a heterozygous mouse inherits one haplotype from each parent containing two class-I loci (K and D) and two class II loci (A and E), each in two allelic forms. It, can therefore, express on its cells a total of 8 MHC antigens (2 class I antigens and 2 class II antigens from each parent). Crossover: Haplotypes, normally, are inherited intact and hence antigens encoded by different loci are inherited together (e.g., A2; B27; Cw2; DPw6; DQw9; DRw2). However, on occasions, there is crossing over between two parental chromosomes, thereby resulting in new recombinant haplotypes. Thus, any one specificity encoded by one locus may combine with specificities from other loci. 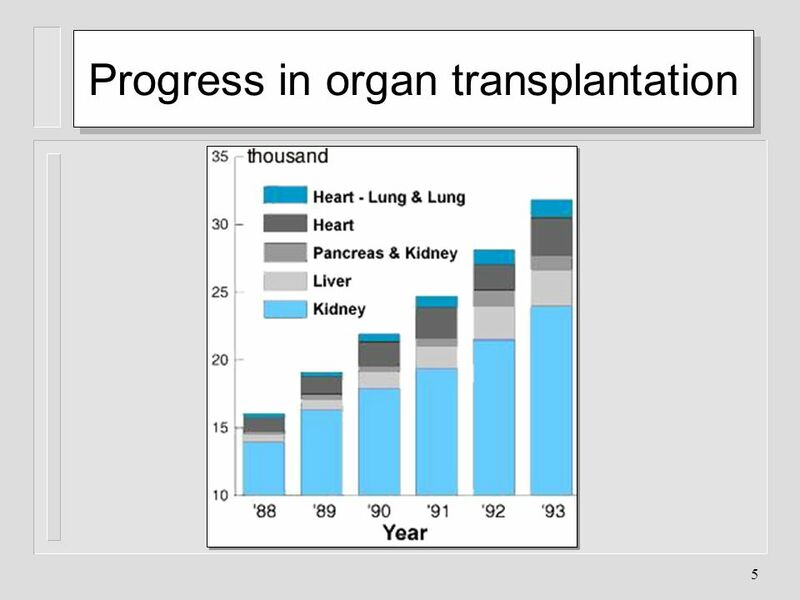 This results in vast heterogeneity in the MHC make-up in a given population. Class-I expressed on all nucleated cells in man, and also on erythrocytes in mice. 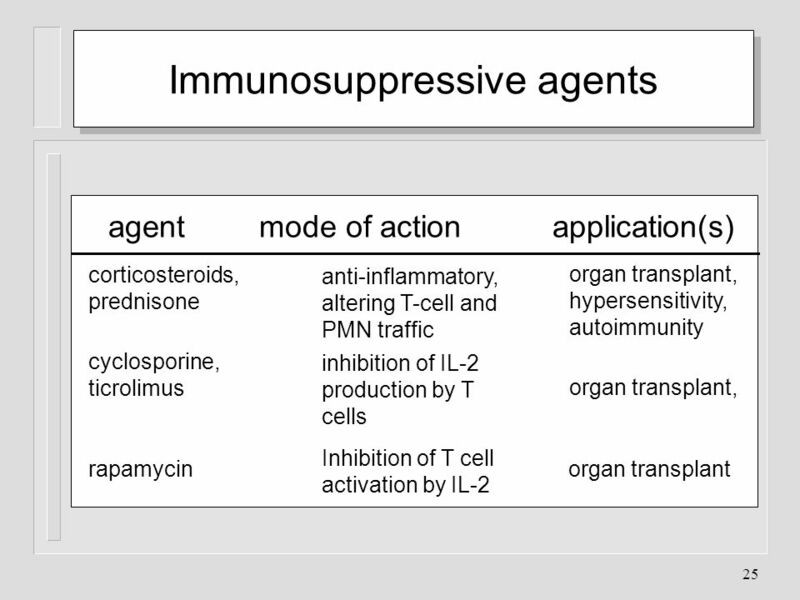 Class-II expressed primarily on antigen presenting cells (dendritic cells, macrophages and B cells, etc.) 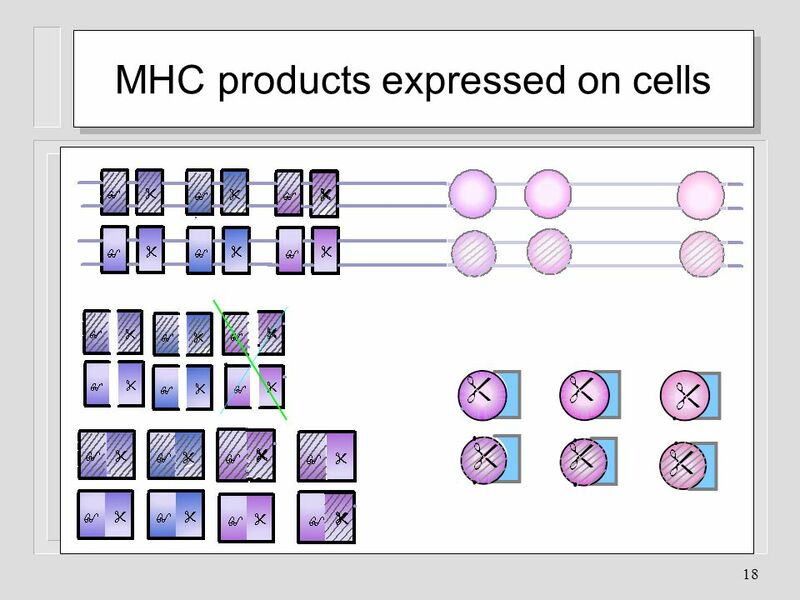 MHC antigen expression on cells: MHC antigens are expressed on the cell surface in a co-dominant manner: products of both parental genes are found on the same cells. However, not all cells express both class I and class II antigens. 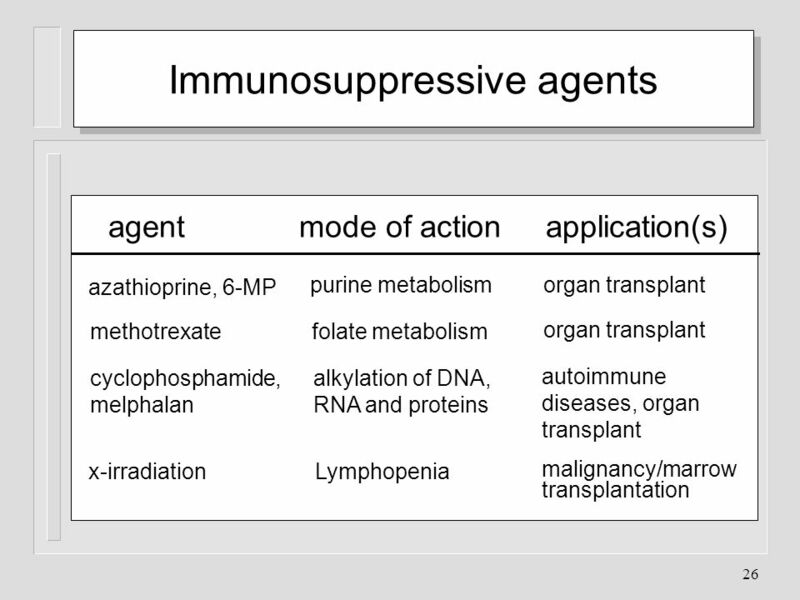 While class I antigens are expressed on all nucleated cells and platelets (and red blood cells in the mouse), the expression of class II antigens is more selective. 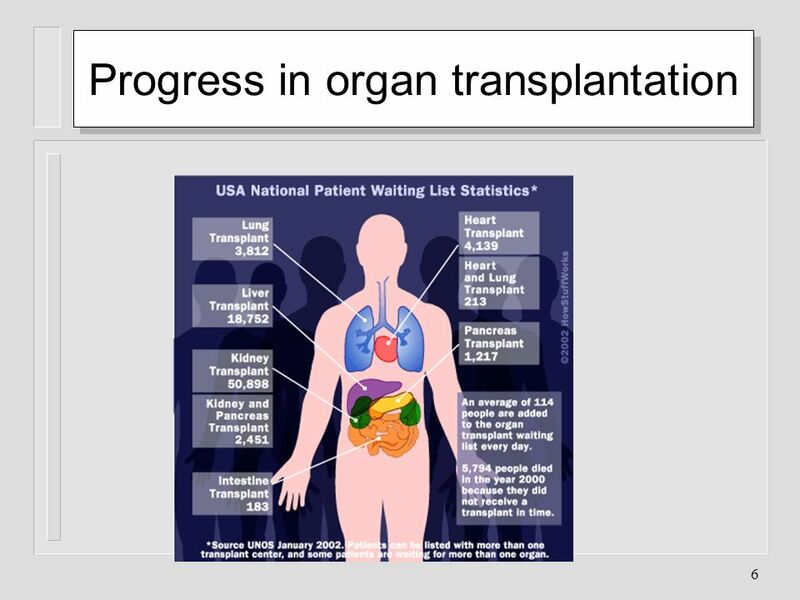 It is expressed on B lymphocytes, a proportion of macrophages and monocytes, epithelial cells, skin associated (Langerhan’s) cells, dendritic cells and a sub-population of T lymphocytes (activated T cells in man and suppressor T cells in the mouse). MLR and CTL generation CD4+TH1 CD8+preCTL CD8+CTL Generation of cytotoxic T lymphocytes Another consequence of the MHC antigen and T cell interaction is the induction of cytotoxic T‑lymphocytes. 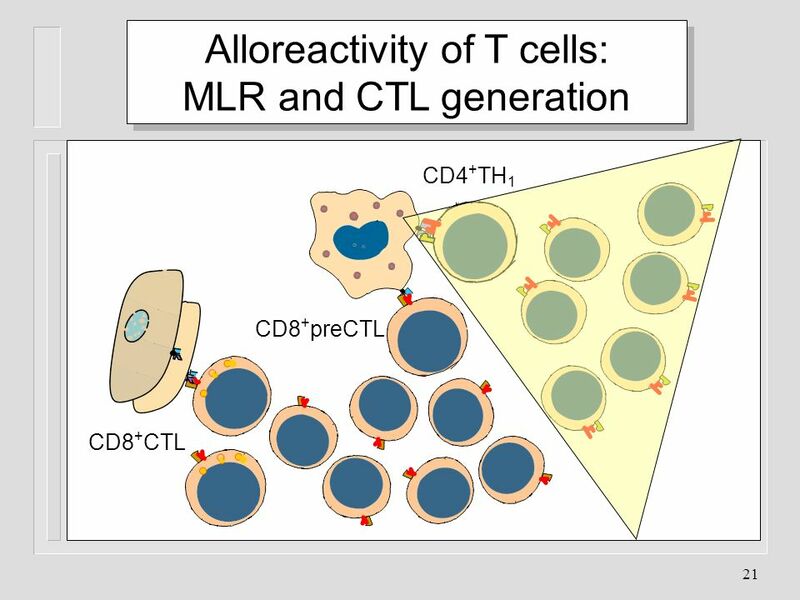 When T‑lymphocytes are cultured in the presence of allogeneic lymphocytes, in addition to undergoing mitosis (MLR), they also become cytotoxic to cells of the type that stimulated MLR (Figure 3). Thus, T‑lymphocytes of 'x' haplotype cultured over 5‑7 days with B lymphocytes of 'y' haplotype will undergo mitosis and the surviving T‑lymphocytes become cytotoxic to cells of the 'y' haplotype. The induction of mitosis in MLR requires disparity of only class II antigens whereas the induction of cytotoxic T‑lymphocytes (CTL) requires disparity of both class I and class II antigens. However, once cytotoxic cells have been induced, the effector cytotoxic cells recognize only class I antigens to cause cytotoxicity. 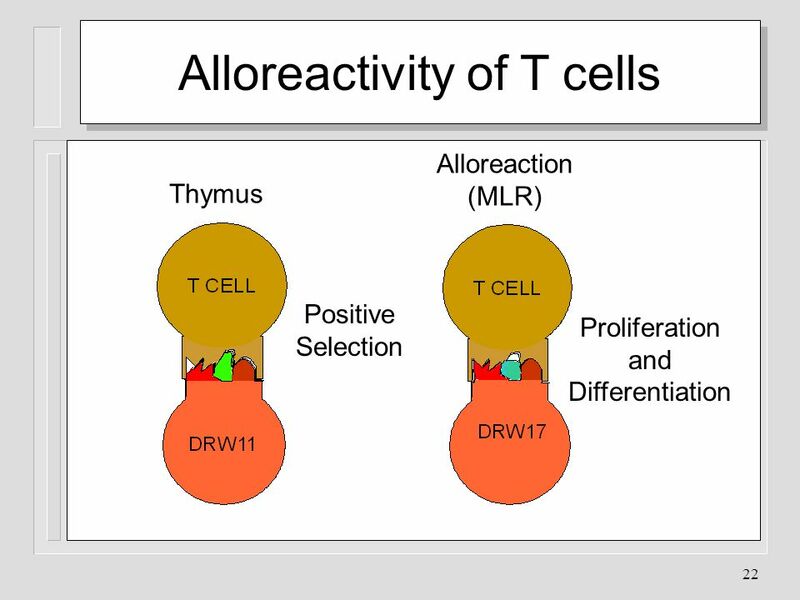 Alloreaction (MLR) Thymus Positive Selection Proliferation and Differentiation Generation of cytotoxic T lymphocytes Another consequence of the MHC antigen and T cell interaction is the induction of cytotoxic T‑lymphocytes. When T‑lymphocytes are cultured in the presence of allogeneic lymphocytes, in addition to undergoing mitosis (MLR), they also become cytotoxic to cells of the type that stimulated MLR (Figure 3). Thus, T‑lymphocytes of 'x' haplotype cultured over 5‑7 days with B lymphocytes of 'y' haplotype will undergo mitosis and the surviving T‑lymphocytes become cytotoxic to cells of the 'y' haplotype. The induction of mitosis in MLR requires disparity of only class II antigens whereas the induction of cytotoxic T‑lymphocytes (CTL) requires disparity of both class I and class II antigens. However, once cytotoxic cells have been induced, the effector cytotoxic cells recognize only class I antigens to cause cytotoxicity. 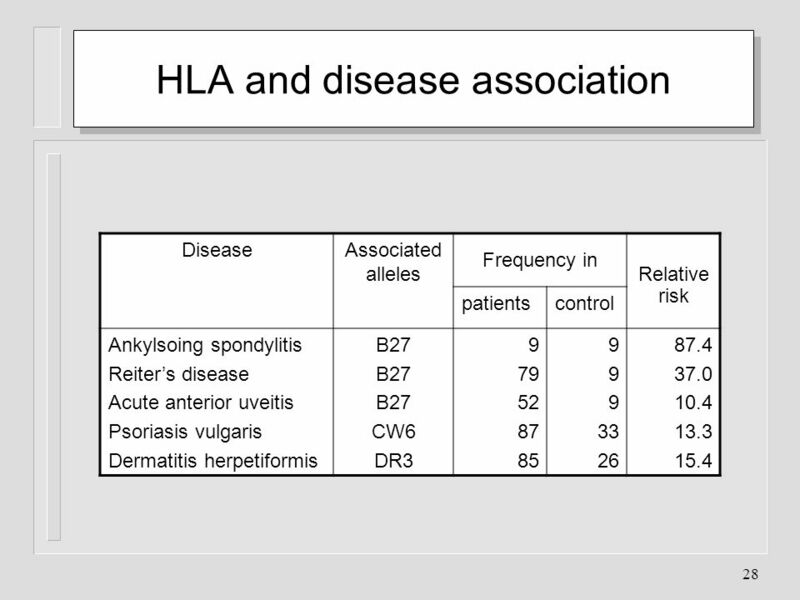 Associated alleles Frequency in Relative risk patients control Ankylsoing spondylitis Reiter’s disease Acute anterior uveitis Psoriasis vulgaris Dermatitis herpetiformis B27 CW6 DR3 9 79 52 87 85 33 26 87.4 37.0 10.4 13.3 15.4 A number of diseases have been found to occur at a higher frequency in individuals with certain MHC haplotypes. Most prominent among these are ankylosing spondylitis (B27), celiac disease (DR3), Reiter's syndrome (B27). Other diseases associated with different specificities of the MHC are listed in Table 2. No definite reason is known for this association. However, several hypotheses have been proposed: antigenic similarity between pathogens and MHC, antigenic hypo‑ and hyper‑responsiveness controlled by the class II genes are included among them. 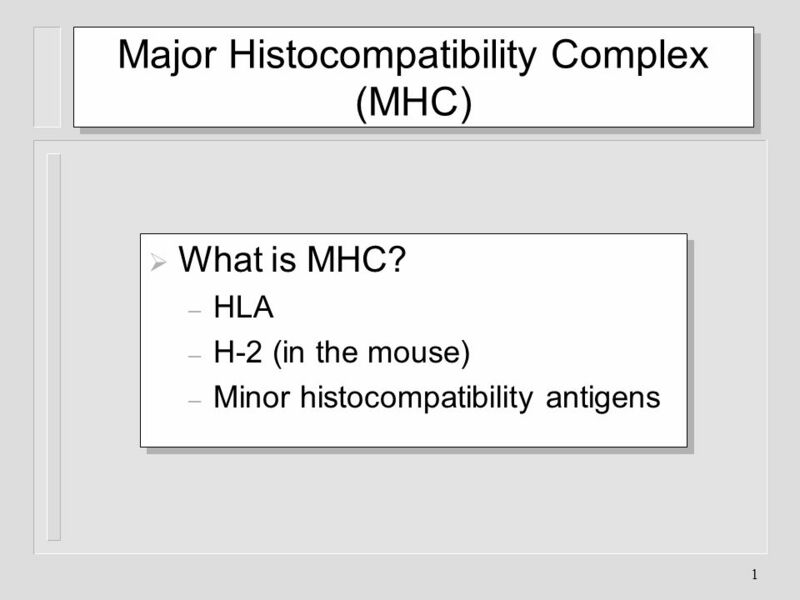 Download ppt "Major Histocompatibility Complex (MHC)"
Major Histocompatibility Complex (MHC) Department of Microbiology.